Seller: original_vintage (1,356) 100%, Location: Rochester, Kent, Ships to: Free Local Pickup, Item: 163613823547 Striking Fusee Watchmans Pin Clock by W Johnson of 54 Threadneedle Street Fantastic bracket style watchmans pin clock. With a single chain driven fusee striking movement. It strikes on the hour and half past. Comes with original door and winding keys and pendulum After setting the clock up it seems to run well, haven’t checked it for time keeping, probably needs a service. Collection only from Kent. can not post. 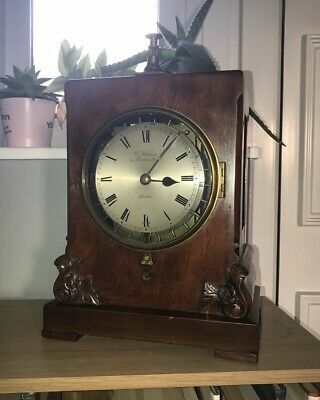 I have pictured next to a tin of Pepsi to gauge the size (tin not included) 28cm wide as base 35cm high 18 cm deep I have found some information on watch clocks org that explains the function and history of this type of clock. This clock shows the general characteristics of the English "pin clock" that was introduced about 1800 and was still made, at least occasionally, into the second half of the century. The clocks were made either in the tall case style shown here or in a bracket or shelf-style. The large disk seen here as the face is rotated by the clockwork and the fixed pointer shows the time of day. When one of the pins on the disk's periphery (spaced the equivalent of 15 minutes apart) moves through the pointer position, it is beneath the end of a lever. If that lever is actuated by the watchman, the pin is pushed into the edge of the disk, and in that position evidences the watchman's visit to the clock during the corresponding time period. (There is a fixed cam behind the disk that pushes the pins back to the protruding position before they arrive once again at the registration position 12 hours later.) Collection only from Rochester Kent ME1 any questions please ask. Cash on collection preferred. Popularity - 151 views, 4.6 views per day, 33 days on eBay. Very high amount of views. 1 sold, 0 available. 151 views, 4.6 views per day, 33 days on eBay. Very high amount of views. 1 sold, 0 available. Seller - 1,356+ items sold. 0% negative feedback. Great seller with very good positive feedback and over 50 ratings. 1,356+ items sold. 0% negative feedback. Great seller with very good positive feedback and over 50 ratings.